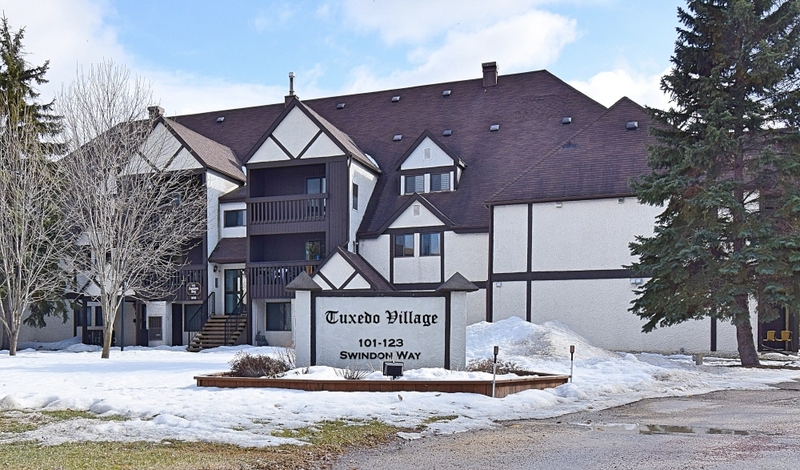 Welcome to Tuxedo Village Condominiums! 1 Bed 1 Bath 854 Sq. ft. This long-time owned smoke/pet free 1 bedroom 3rd floor condo is very spacious and it faces SOUTH and overlooks the trees and Taylor Avenue. Features a large white kitchen with plenty of cabinets, counter space, a garbeurator and a pantry! The living room is spacious and has an ornamental fireplace and has patio doors leading you to the south-facing balcony. The dining room is also a good size. The bathroom is large and offers a newer toilet and sink, white vanity and mirror with a medicine cabinet. Enormous master bedroom with a large closet and in-suite laundry! In-suite storage and central air-conditioning. This is a pet-friendly complex and is nestled right in Tuxedo! Enjoy the seasonal pool and community gardens. Visitor parking. One parking stall included just steps away from the building. Amazing location – close to the Outlet Mall, Superstore, IKEA, Assiniboine Park, Restaurants and so much more! Great opportunity! 1 beds 1 Bath 854 Sq. ft.